September in Zanzibar is a wondrous time of the year to visit. The weather is just about as perfect as it can be and the people of the main islands and even the smaller outlying islands are eager to please visitors and provide them with experiences and adventures to last a lifetime. September's weather in Zanzibar is the penultimate example of what vacation weather should be. The average high temperature during the day is about 27°C (81°F). The average nightly low is a mild 22°C (72°F). The sea temperature around Zanzibar is on average 26°C (79°F). Recorded precipitation for the month is usually around 50mm or 2 inches and visitors should expect 9½ to 10 hours of sunshine each day. The relative humidity average for September is 56%. Visitors to Zanzibar are advised to not leave the island without first experiencing the Jozani Forest in the Jozani-Chwaka Bay National Park. This is the only national park on Zanzibar and it features tons of interesting things to see. 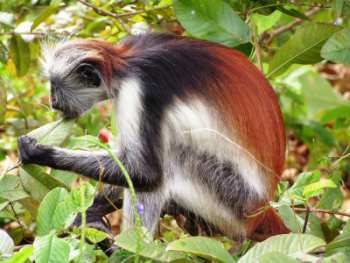 Perhaps the most popular sight is the Zanzibar Red Colobus monkey, which can only been seen on the island of Zanzibar, nowhere else in the world has them. There are numerous nature trails that can be navigated with or without a native guide, although a guide is recommended so that they can point out some of the less obvious sights. Visitors are likely to see monkeys as well as many other species of small mammals. Jozani is particularly known for the more than 100 species of butterflies that can be observed feeding on the nectar of the many tropical and exotic flowers throughout the area. There is also a mangrove boardwalk which allows visitors to walk along the forest as it extends into the sea. Visitors will be able to observe up close the denizens who inhabit the brackish waters between the sea and the mangrove swamp.